Our focus during English this half term is non fictional writing. For the first 3 weeks we will be reading Gangsta Granny by David Walliams. The children will be writing a biography on the protagonist, Granny, and incorporating the features of a biography in their learning. We will be showing the children how to use their grammar focus, but in a different genre and context of writing. The final 2 weeks will be using research based facts and information to write a non-chronological report on The Tower of London. Our aim is for the children to became as confident in writing in a more formal, non fictional genre, as they are in empathising with a character and writing a narrative. The end of this half term’s learning will culminate in a trip to The Tower of London. This half term, in Year 5, we will be covering 2 units from the Maths syllabus. Our topic this half term is called Location, Location, Location. The children will be learning all about the United Kingdom, including it’s counties, cities, topography, human and physical geography. The creative project is for children to work as a group to create a 3D map of the UK—including man made and natural landmarks. During Creative Curriculum week we will be aiming for children to learn about all the features explained above, as well as comparing changes that have happened over time. Votes for schools is a program that encourages ‘pupil voice’. Every week the children are given a question to debate, relating to a pop culture topic. Throughout the session we learn facts, and hear differing opinions. At the end all children vote as to whether they agree or disagree with the initial question. Some of our topics this term have been about whether graffiti is art or a crime and the importance of education in a war zone. In MFL children will continue to learn about to speak and write about their live in French. Spelling journals need to be completed as part of the children’s home learning. These will be given to children to complete on a Friday and will need to be returned to school by the following Friday. If the children need support please feel free to return the journal earlier, and encourage children to speak to their class teacher for additional help. In addition to this children should be reading every day. They do not necessarily need to read to an adult and are allowed to sign their own reading log to show that they have read and how much. If there are any problems with book selections, please speak to your child’s teacher. Maths Logs also need to be completed as part of the children’s home learning. These will be given to children to complete on a Friday and will need to be returned to school by the following Friday. If the children need support please feel free to return the journal earlier, and encourage children to speak to their class teacher for additional help. Stem week begins on the 11th March 2019. STEM stands for Science, Technology, Engineering and Maths. The Year 5 topic is Fashion and we have a fun packed week of designing and entrepreneurial activities for the children to engage in. Watch this space for more information! Year 5 will be swimming for the whole of the Spring Term. Please ensure that when it is your child's day for swimming, that they come into school with a swimming costume/trunks, towel and swimming hat. Your child may bring deodorant to swimming but aerosols are not permitted, so please ensure that if they do bring deodorant it is a roll on. If you collect your child from school, please continue to do so at 3.10 from your child's classroom. If your child walks home alone they will be released from the swimming pool. Swimming is compulsory as it is a core part of the curriculum and, for this term, will replace the children's weekly hour of PE with their class teacher. Each class will still have an hour, every other week, of PE with Mrs Rose and Mr Smith. We believe that the school swimming lessons are fundamental to the mental and physical health and wellbeing of your child. Should you have any questions about any of the above please contact your class teacher. On Thursday 30th January, we celebrated Young Carers Awareness Day. All of the children at William Bellamy Primary School were invited to come into school dressed in yellow, for a donation of £1. Year 5 attended an assembly, where they were told all about some very special children who cared for members of their families. We were shown some of the hurdles that young carers have to face, on a daily basis. In the afternoon, Year 5 children discussed various different scenarios that young carers deal with, the children were involved in a class discussion relating to these. After this they all made a poster, highlighting how courageous these young people are, and how important it is to show them some support and kindness. The texts that we will be reading this half term are Varmints by Helen Ward and Cosmic by Frank Cottrell Boyce. Varmints is a short story that provides information not only through the text, but also through the indepth and detailed illustrations. By the end of the 2 weeks spent reading Varmints, the children will have practised writing descriptively and empathetically—finalised within a narrative story of their own. The story of Cosmic will allow the children in Year 5 to enhance their skills in writing to build excitement and suspense. Grammatically, we will be focussing on the use of specific parts of the English language, such as the use of correct determiners, the passive tense and the perfect form of verbs for time and clause. We will be continuing with the same topic, Victorians, this half term to ensure that the children receive a comprehensive and cohesive overview of an important historical period. Throughout the half term, the children will be completing an artist study of William Morris—a prolific Victorian artist. During Creative Curriculum week, we will be learning about the Victorian line if succession, the British Empire and the Industrial Revolution. Reflect on the challenges of leadership. In Science this term, our topic is ‘Animals (including humans)’. The children will be learning about gestational periods, foetal development and the changes a human goes through during their life span. This half term we will be focussing solely on one text; Street Child by Berlie Doherty. The children’s main piece of independent writing will be a persuasive letter, written from the perspective of Dr Barnardo to the government. The children will be using their knowledge of Victoria street children, and the perils they faced in their lives. Together, we will be looking at the different hurdles that poor Victorian children faced, from entering the workhouse, to forced child labour and living on the streets. All of Year 5 will be encouraged to empathise with the feelings of these children, and to explain how they would feel if they were in that position. Grammatically, children will be consolidating their knowledge and understanding of parenthesis and the use of semi colons, in order to change the structure of their sentences and to deepen their writing. This half term, in Year 5, we will be covering 3 units from the Maths syllabus. Our Creative Curriculum topic this year is the Victorians, which links very closely with our English text. For the practical elements of the topic, children will be making their own Victorian Christmas wreaths. During the Creative Curriculum week, children will be writing diary entries and letters (using cross curricular links), identifying the importance of important historical figures and spending time in a Victorian school setting. · What does religion teach about peace and ways of resolving conflict? · How are these beliefs expressed in action in the world? Christmas theme - Peace: the message of Christmas. In Science this term, our topic is ‘Changing Materials’. Children will be completing a range of investigations and experiments, and using scientifically appropriate language to write these up—detailing what they have done and the results they have gathered. 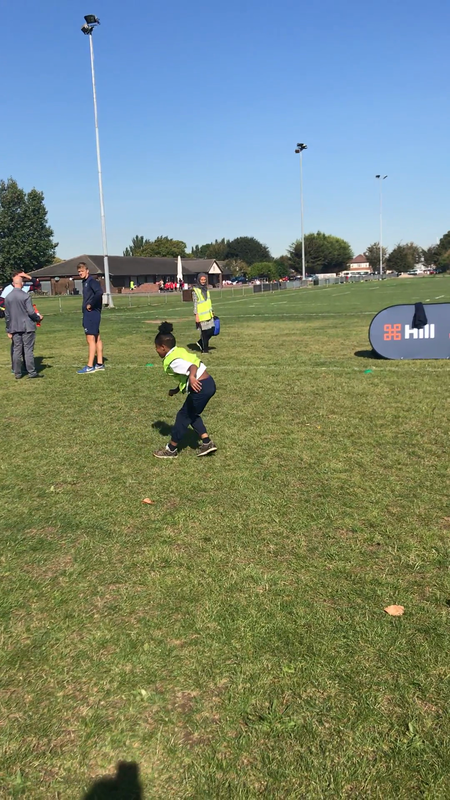 Year 5 were lucky enough to be invited to a tag rugby competition on Tuesday 25th September 2018, at Romford and Gidea Park Rugby Club. All children were asked to work as part of a team. Throughout the day all the teams played against each other, as well as learning basic rugby skills such as passing backwards and moving together as a group. Each group of children were allocated a group leader, as well as a student from Cambridge or Oxford University. The emphasis of the day was not solely about sport, but mainly about team work and demonstrating a team spirit and sportsmanlike conduct. As always, our William Bellamy pupils shone and one of the teams were even awarded a trophy for having the best team spirit. A wonderful day, thoroughly enjoyed by all. As a result of participating in this competition, Year 5 have also been invited to go to Twickenham to watch the Cambridge and Oxford University teams play a full rugby match on Thursday 6th December 2018. Details to be sent out nearer the time! Welcome back to another year at William Bellamy Primary School. As a team, we have got lots of exciting opportunities coming up, for all the children in Year 5. As a school our emphasis, this year, is on exciting and thought provoking learning, as well as offering a range of trips and workshops to engage mind and body. Here's to a successful year!